The burdock root used in this item is left unskinned and thickly sliced, allowing you to more fully enjoy its scent and texture. Simply boil in bag to enjoy. Kinpira is a Japanese cooking method somewhat similar to sautéing, and is often used with ingredients such as burdock root. Burdock root is not commonly seen in Western cooking, but is quite popular as an ingredient in traditional Japanese foods. The burdock root used in this item is unskinned, and is rich in nutrients. It contains lots of dietary fiber, which invigorates the digestion and helps with the expulsion of waste; and its skin in particular contains a lot of polyphenol. It also contains antioxidants, and is good for your liver. Pregnant women and those with allergies to ragweed, daisies, and/or chrysanthemums, however, should not eat burdock. This burdock root has been thoroughly cleaned (for about 1.5 times as long as is typical) to remove any dirt. We monitor and adjust the temperature during this item’s production so that the ingredients retain their flavor and texture (if burdock root is overcooked, it loses its crisp texture, sharp flavor, and distinctive fragrance). It is cooked in a kettle over an open flame, with someone standing by to check its condition as it cooks. When cooking with burdock root from scratch, carefully cleaning its skin can be quite a chore. 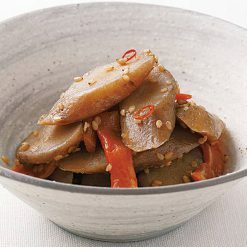 Sugarlady’s Kinpira gobo makes eating unskinned burdock root a much simpler task! 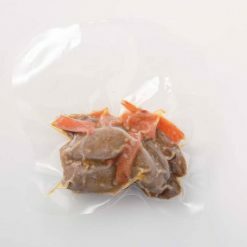 This item is easy to prepare, needing only to be boiled before eating. It is designed to be just the right amount for 1 serving (one of our Petit Gourmet products) for your convenience. Place the kinpira gobo (still frozen, still in its bag) in boiling water. Once the water returns to a boil, boil the kinpira gobo for about 5 minutes. Once the kinpira gobo has been defrosted, transfer it to a bowl and serve it as-is.If the bag touches the rim of the pot, or if the bag is sticking out or hanging out of the pot, the bag can melt and develop holes. Please boil with care. The bag and its contents will be very hot after boiling, so please use caution to avoid burns. This product contains burdock root (domestic), carrots (domestic), soy sauce, refined sake, vegetable fats and oils (soybean oil, sesame oil), hon-mirin, sugar, sesame, shiitake mushroom extract powder, chili pepper, (product contains wheat).. This product is not suitable for anyone with allergies to wheat, soy or sesame. Origin of ingredients: burdock root/carrots (domestic). Prepared and packaged in Japan.